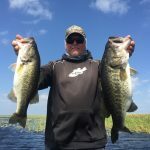 The past couple of weeks on Lake Okeechobee have been fantastic. You can go almost anywhere and catch fish. The winds have been from all directions and have been high, but it has not affect the water clarity. The water temp is in the low to mid 70’s. The best bait has been Topwater, Spinnerbaits and Senko’s. The topwater bite has been good throughout the day. Just find any opening in the grass and use it there. The best topwater has been a spook. Good areas to fish are Grassy Inland, Kings Bar, the Pass, Tin House and the Lakeport area of the lake. Here is a picture of a couple of fish I have caught this week.